Adapted from January article for BL Magazine. Gardens in January are generally stark and skeletal. Not exactly conjuring up an idyllic scene I know. Seeing borders stripped back to frameworks and trees unclothed is rather useful though, especially when it comes to pruning fruit trees! Yes, we’re back to the ‘grow more fruit’ mission with this month’s nitty gritty guide to pruning apple and pear trees. Before you hastily navigate away, hang on, my mission is to explain this complicated process in simple and logical steps [ok I’ll be honest, with a few technical terms thrown in]. First of all, it’s good to know that pruning can be done in late summer, usually in August, and in late winter, ideally January. Summer-pruning is primarily concerned with cutting back the current season’s leafy growth and is mainly done on the restricted/trained trees like espaliers. Winter pruning is primarily for standard tree forms. In my mind, pruning is really about getting to know the character of your tree. Once you are familiar with how old it is [a rough idea is fine], how it grows [big standard, bush or trained tree] and how it performs [in terms of fruiting*] you are on your way to understanding the pruning approach your tree needs. All you need now are a handful of plant science facts, a modest amount of confidence and the right tools. Start by staring at your tree. Keep staring. Look at the main trunk and follow the branches, see how they form, work your way to the tips. Can you make out the new, fresh growth from last season? Can you work back to the trunk identifying each year’s growth? Can you make out the shorter, stubby, wrinkly-looking twigs? These are referred to as ‘spurs’[see picture below], magical little stems that carry the fruit. It is these fruiting spurs that we are trying to encourage by the way we prune. After gazing longingly up at your tree you may feel confused and walk away unsure. But don’t give up! Keep looking. Keep going back. If you have an older tree you will probably find it harder seeing these growth sections than if you have a younger specimen. Nip down to a local nursery and take a long look at some younger fruit trees. It may help you see the differences more easily. Now for the science, ‘Apical Dominance’ [keep reading, it’s just about hormones] is when a single, vertical stem grows stronger and more dominant than all other stems. Plant hormones [technically known as auxins] dictate the way a tree grows, flowers and fruits and it is a high concentration of these hormones at the tip of a stem [called the ‘terminal bud’] that causes this apical dominance. The problem with this type of growth is that it is purely vegetative, which isn’t very good if we want more fruit. By reducing the apical shoot [pruning out the ‘terminal bud’], the hormones will be reduced, encouraging axillary buds [this is the name given to buds that develop into side branches] to grow instead. It is also useful to know that horizontal branches have less concentration of these hormones, making these perfect candidates for producing fruit…so don’t prune these out [unless damaged or crossing others]! Some fruit tree training techniques make the most of this by actually tying young branches down to mature horizontally. Clever. One final bit of essential knowledge is… the harder you prune back, the more vigorous the new growth will be [it’s to do with the root/canopy ratio and the amount of energy produced]. With this in mind, cut any stronger growing stems by no more than a third, while weaker growing stems can be cut back much harder [say two thirds or to just a couple of buds]. It is also for this reason that any major pruning of older fruit trees should be done cautiously, little by little over a few years to ensure you keep a root/canopy balance. Right. You should know the character of your tree, you have a number of essential facts to hand…where do you start? A good pruning saw, loppers and secateurs are handy. Then, start with the three ‘D’s’ – take out all the Damaged, Diseased and Dead branches. Next, look for branches that are crossing and rubbing together. Aim for an open-centred framework as this will reduce the chances of developing scab [a fungal disease] by allowing air to circulate more easily. If your tree is old and needs a lot of pruning work, you may just start with taking out the three ‘D’s’ one year, crossing and rubbing branches the next, branches growing across the centre the following. For younger and trained [espalier or fan shaped] trees you may only need to keep an eye on branches growing in the wrong direction and cutting back new shoots to 2 to 3 buds [in August] to encourage the growth of side branches and fruiting spurs. All this may seem daunting and if you are still frightened about pruning your fruit tree there are some very useful video clips on youtube.com and on Landscapejuice.com. Or, for another confidence boost, fruit pruning workshops are brilliant, check with your nearest horticultural college. * It is useful to be aware that there are two types of fruit-bearing forms. Tip bearers and Spur bearers. 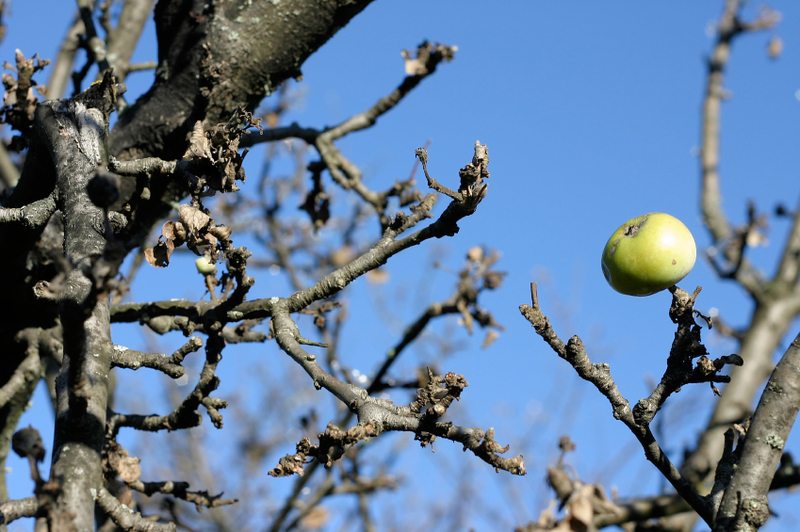 Tip bearing varieties tend to fruit at the tips of the branches and will therefore require lighter pruning. Spur bearers [which tend to be the most common form] will bear fruit along the short stubby spurs along the side branches. Some varieties however do bear fruit on the tips and the side spurs! To identify which type your tree is you will need to look carefully for the short stubs and decide where they mainly grow.